1933. 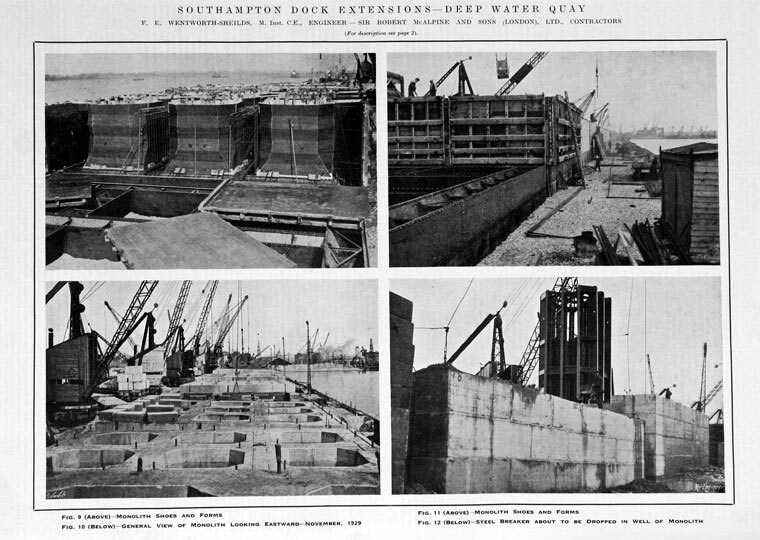 Southampton Docks Extensions- Deep Water Quay. 1872 McAlpine won his first major construction contract, to build 100 cottages for miners at Stonefield near Hamilton. 1875 He began to invest in property, building houses to let in Hamilton, Stonefield, and Motherwell. Leased three brickworks and experimented with the use of concrete to make lintels and doorsteps. By 1876 The firm was building walls of houses of rubble concrete blocks. 1880 The house-building ventures collapsed. Robert took his cashier, William Richmond, into partnership in his contracting business which avoided the business falling into the hands of his creditors. Robert continued nominally as an employee of the firm until he was discharged from bankruptcy in 1881. 1882 Built the largest factory in Europe, for the Singer Manufacturing Co at Kilbowie, Dunbartonshire. 1883 Dissolved the partnership with William Richmond. 1884 Won the contract to build the Barrhead to Ardrossan section of the Lanarkshire and Ayrshire Railway. 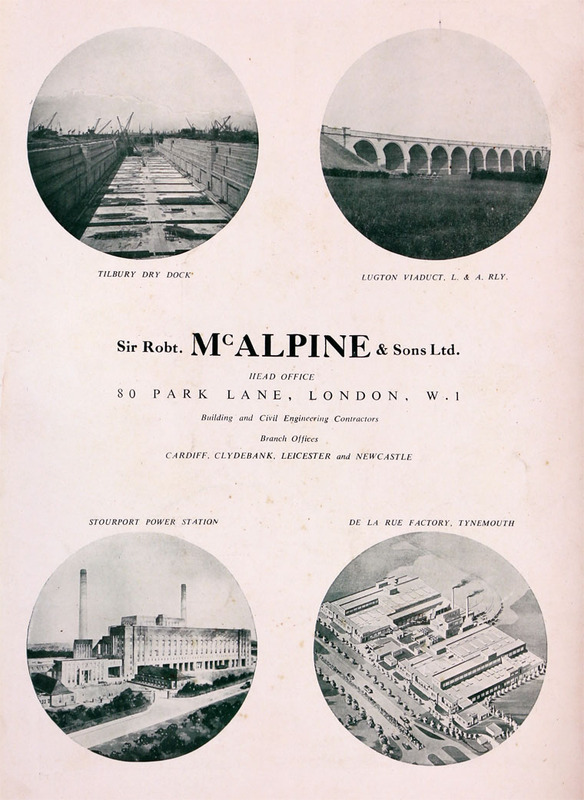 McAlpine brought his eldest sons, Robert junior (1868–1934) and William (1871–1950), into the business, which became known as Robert McAlpine and Sons. 1893 Robert and William became partners. Between 1884 and 1904, Robert McAlpine and Sons built nearly 150 miles of railway in Scotland and Ireland, pioneering the mass use of concrete in railway construction, most famously on the 40 mile Mallaig extension of the West Highland Railway, including the Glenfinnan Viaduct, and the Borrodale Viaduct - the longest concrete bridge span built. His other sons later became partners - Malcolm McAlpine (1877–1967) in 1899, Alfred (1881–1944) in 1902, Granville McAlpine (1883–1928) in 1905. 1900 McAlpines won its first contract in England, for the construction of a graving dock at Hebburn-on-Tyne. 1905 Malcolm McAlpine set up the Victoria Agency in London in order to win contracts in England. By 1914 McAlpines had worked on a number of reservoir and railway contracts in England. WWI The volume of work in England increased dramatically - built army camps, munitions factories and aerodromes. 1918 Robert was created a baronet. 1920s McAlpines built many new council house estates, including in London and Manchester, as well contracts for major roads, and Takoradi harbour on the Gold Coast. 1922 The company's reputation as a pioneer of concrete construction led to contracts for the construction of Wembley stadium and the buildings of the British Empire Exhibition. Other notable buildings were the Black Cat factory in Camden and the Firestone Tyre and Rubber Co's factory at Brentford. 1925 Built a sugar-beet factory at Wissington for British Sugar Manufacturers and later others at Peterborough, Selby, Bardney, and Brigg. The firm accepted payment in shares and debenture stock in British Sugar and the Central Sugar, Lincolnshire Beet Sugar, Second Lincolnshire Beet Sugar and Yorkshire Sugar companies. 1920s/30s McAlpines created a number of limited companies to complete for large contracts including Sir Robert McAlpine (London) Ltd which carried out major dock construction in London during the late 1920s. 1934 the other partners agreed that McAlpine (Midland) should be run by Sir Alfred McAlpine alone, as his own business. 1937 Bought out the sole remaining partner in the Dorchester which was run by the McAlpine family until 1976. 1940 Sir Alfred and his son Jimmie formed a new company, Sir Alfred McAlpine and Son, to acquire the business of McAlpine (Midland). 1949 Company was called Sir Robt. McAlpine and Sons Ltd. Postwar: Built major steel works at Ebbw Vale, Cardiff, Port Talbot and Parkgate (Rotherham). 1958 Member of the Nuclear Power Plant Co.
1960-2 Built Shell Centre in London and Spencer steelworks at Llanwern. 1961 Acquired Gee, Walker and Slater Ltd, a family run building firm. 1972 Public offer of limited number of shares in Newarthill Ltd, formed that year to acquire the company. The family remained the principal shareholder. 1974 McAlpine-Sea Tank - Designed Shell/Esso's first concrete production platform. ↑ The Engineer 1974/02/07 p 7. This page was last edited on 30 January 2019, at 08:05.